The St. Catharines United Mennonite Church traces its beginning to the early 1940s when more and more Mennonite families were moving to the city for economic reasons. Some families had struggled in farming communities on the prairies during the 1920s and 1930s. Other families had tried to make a living cutting lumber near Reesor in northern Ontario. Moving to industrialized southern Ontario offered better employment opportunities. Some families joined existing churches in Vineland or Virgil, but due to wartime gasoline rations and many families not having a car, Wilhelm Schellenberg contacted the families he knew, and held the first worship service on 4 July 1942, in a rented hall at 345 St. Paul Street (Arthur Murray Dance Studio). On 30 April 1944 a meeting was held under the leadership of Wilhelm Schellenberg to organize the people attending the services into a church group and to elect the first church board. On 15 October 1944 the first membership list was drawn up. Since they could only rent the hall for Sunday morning, it was decided to build a church. The work started in the spring of 1945, but immediately there were difficulties. It was still wartime, and in order to buy building materials, a permit from the Wartime Prices and Income Commission, was required. This permit was denied. Not being incorporated also meant that they were unable to borrow money from a bank. In spite of the difficulties, the church was built, and it held its first worship service on 16 September 1945 in their own building, located on Carlton Street. At a membership meeting on 28 October 1945, they officially elected Wilhelm Schellenberg as their leader, adopted the official name of “The St. Catharines United Mennonite Church” and accepted the constitution and by-laws of the Ontario United Mennonite Churches. Several years later, on 7 March 1949 the Church was incorporated by Letter Patent from the Government of Ontario. St. Catharines United Mennonite church on Garnet Avenue, 1949-1967. The St. Catharines United Mennonite Church membership grew significantly with the arrival of post-war refugees, so that they sold their building on 15 February 1949, and built a new church at 101 Garnet Street. The first worship service was held on 28 August 1949. In 1956 a group of 48 members left to found Grace Mennonite Church which worshipped in English. In 1961 the building was expanded with the addition of an education wing, but soon even this did not provide sufficient space, so that a decision was made on 3 April 1966 to sell the Garnet Street building, and build a new worship place at 335 Linwell Road. The dedication service for this building took place on 19 March 1967. This location continues to be used till today (2016). 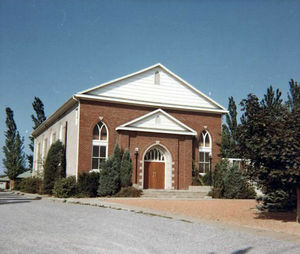 St. Catharines United Mennonite Church on Linwell Road, 1967-present. The language of worship was exclusively German in the beginning. Sunday School for children was in German, with the use of English to explain the lesson. Parallel English and German classes were started in 1958. The use of German in the Sunday School program was dropped in the fall of 1978, with the introduction of the Foundation Series curriculum, with the exception of on adult class. Worship services consisted of German and English elements until 1988, when a new structure was adopted for the Sunday morning worship services. A German service was held from 9:45 to 10:30 a.m. during the Sunday School hour, followed by the English worship hour from 11:00 till noon, with the exception of the first Sunday of the month, when there would only be an English family worship service. This structure was still being followed in 2016. This congregation used lay minister in the beginning. The first salaried minister was Peter Heinrichs in 1952. The first associate pastor hired was David Stobbe in 1979. From the beginning, the St. Catharines United Mennonite Church had deacons that spent time visiting members – the sick, the elderly, the hospitalized, and also assisted the ministers in the serving of communion. Since 2012, one associate minister has had primary responsibility for ministry to seniors. From the outset, St. Catharines United Mennonite Church has had an active music ministry with various choirs and music groups that served at services, funerals or in the homes for seniors. In 2016 there were three choirs that sang regularly in worship services – German Choir, Praise and Worship Choir, and Church Choir. The church has had ladies groups whose primary role was supporting relief and mission work though sewing clothes, blankets, quilts, preparing health kits, having bake sales and raising money through an annual bazaar. The ministry to youth has changed over the years. In the 1940s, the youth group was synonymous with church choir and ranged in ages from 16 to young married couples without children. By the 1970s, there were distinct junior youth and senior youth groups, divided along grade levels in school. A kid’s club program for elementary school age children was started in 2007. St. Catharines United Mennonite Church is a member of Mennonite Church Eastern Canada, supporting ministries beyond the local congregation, through prayer, financial support, and individual involvement. This support extended to such activities as volunteering in the Christian Benefit Shop, supporting Mennonite Central Committee, Mennonite Disaster Service, Mennonite care homes in the Niagara region and sponsoring refugees. Canadian Mennonite (12 July 1966): 16; (6 November 1970): 10. Mennonite Reporter (28 November 1994): 17; (27 November 1995): 16. 50th anniversary of the St. Catharines United Mennonite Church, 1945-1995. St. Catharines: The Church, 1995, 182 pp. By F. J. Andres. Copied by permission of Herald Press, Harrisonburg, Virginia, from Mennonite Encyclopedia, Vol. 4, p. 401. All rights reserved. The St. Catharines United Mennonite Church (General Conference Mennonite) located on Garnet Street on the east side of St. Catharines, Ontario, was organized in 1946 by 16-18 families who had moved to the city or settled on neighboring fruit farms, led by W. Schellenberg from the Essex County United Mennonite Church in Leamington, Ontario, who served as its first pastor until 1950, when he retired from active duty. The St. Catharines United Mennonite Church belongs to the Conference of United Mennonite Churches of Ontario and to the Conference of the Mennonite Churches of Canada. The first church was built in 1946, replaced in 1948 by a larger church seating about 450. Its membership in 1957 was about 430, with P. J. Heinrichs as pastor. Rempel, Nelly and Alf Redekopp. "St. Catharines United Mennonite Church (St. Catharines, Ontario, Canada)." Global Anabaptist Mennonite Encyclopedia Online. May 2016. Web. 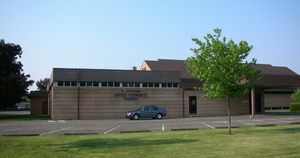 23 Apr 2019. http://gameo.org/index.php?title=St._Catharines_United_Mennonite_Church_(St._Catharines,_Ontario,_Canada)&oldid=162501. Rempel, Nelly and Alf Redekopp. (May 2016). St. Catharines United Mennonite Church (St. Catharines, Ontario, Canada). Global Anabaptist Mennonite Encyclopedia Online. Retrieved 23 April 2019, from http://gameo.org/index.php?title=St._Catharines_United_Mennonite_Church_(St._Catharines,_Ontario,_Canada)&oldid=162501. ©1996-2019 by the Global Anabaptist Mennonite Encyclopedia Online. All rights reserved. This page was last modified on 27 November 2018, at 12:44.